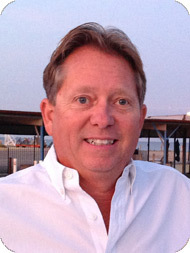 Yacht Broker Mike Levell : Atlantic Yacht & Ship, Inc.
Mike Levell was born on the shores of Lake St. Clair in southeast Michigan. He now splits his time between Michigan and south Florida. Back in 1983, he decided to buy a 52′ wooden motor yacht to restore and cruise the Great Lakes. The restoration happened and he was hooked on boating. Shortly thereafter, he was offered a mate position on a busy corporate yacht cruising between south Florida and the Great Lakes. This naturally led him to get his master’s license. He has since maintained and captained many motor yachts all over the Great Lakes, the East Coast, and Florida (including about 25 trips between south Florida and the Great Lakes). In 1991, a happy repeat client of AYS introduced Mike to the company and he has been with us ever since. Mike prides himself on having some of the cleanest yachts available among his listings. He prefers to preview the yachts that he shows to his buyers to make sure that they are as good as the photos and spec sheets portray. He is not afraid to travel for his clients. The majority of his clients come back to him every time they are ready for a different boat.